Review Halloween is round the corner and with the Saw 3D movie, the seventh instalment of the bloody franchise set for release, Konami has published its second video game tie-in Saw II: Flesh and Blood. This game is grimace from go. The first task – to jab a scalpel in your character's eye and remove a key to his freedom – had me wincing in disgust, but this is Saw, so it's no less than you should expect. Several stomach churns later and this short introduction culminates in a cliché decision to either sacrifice my own life or that of a child. Sorry kiddo, there's only one real outcome here. Or is there? 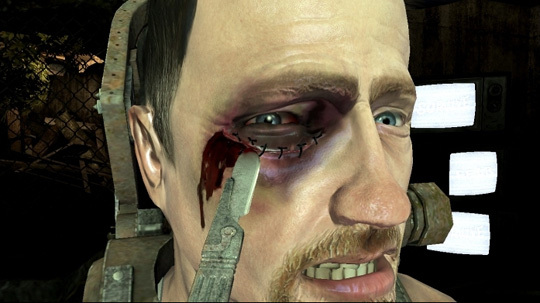 Throughout most of the game we control Michael Tapp, son of Danny Glover's character in the first Saw film and protagonist of the original game. Newspaper reporter Michael wants to know about his father's demise and Jigsaw, being the kind guy he is, sneaks up, sedates our helpless character and puts him through a series of life threatening puzzles. Careful what you wish for boy. 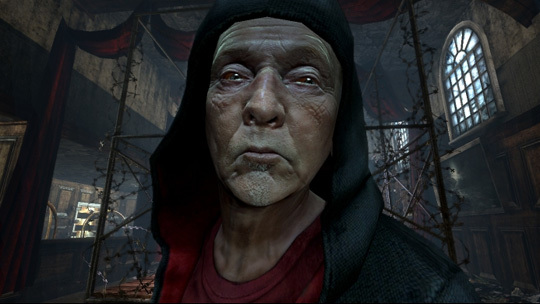 Jasper Carrott lookalike Tobin Bell reprises his role as the voice of Jigsaw, aka the terminally-ill psychopath Jon Kramer. With numerous references to the films and a predictably cheesy story of its own, Flesh & Blood's somewhat unoriginal script does have its moments. So, while a Saw fan may take comfort in the film references, the rest of us are left to soak up the anaemic plotline, which is mostly torture.